The merchant marine is a civilian auxiliary of the U.S. Navy, but not a uniformed service, except in times of war when, in accordance with the Merchant Marine Act of 1936, mariners are considered military personnel. 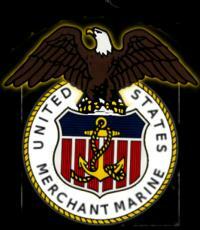 In 1988, President Ronald Reagan signed a bill into law making them veterans of merchant mariners who serve in war. They were considered civilians during WWII and did not receive any of the benefits given to members of the U.S. armed forces. Note: Please put in subject line of e-mails, "MERCHANT MARINE". Also note if your e mail is not correct, you will receive no furture contact from the SSFOA. If you would like to share your story or pictures, please send comments to stevenewton69@hotmail.com Please note that if you send comments, SSFOA deems that permission to use as appropriate.